Dog is still on the menu in south China, but dog ownership has exploded with Shenzhen's fortunes, as seen by its pet stores. Shenzhen, China (CNN) -- When Shenzhen housewife Zhang Lin was growing up in rural Guangdong province, her family kept guard dogs, some of which were slaughtered for meat during the Lunar New Year. Now she is the owner of Dou-dou, a high-energy miniature poodle she bought for 4,000 yuan ($626), more than triple this southern Chinese city's monthly minimum wage. She never eats dog meat and treats Dou-dou like her child. "Growing up, we always had dogs around, but their purpose was [for] meat and guarding the house," Zhang said. "Dou-dou is my companion." Zhang regularly takes Dou-dou to King Glory Plaza, a large public square dominated by an upscale shopping mall, where the Shenzhen middle class come out to play. At night, the square is filled with children whizzing by on roller-skates and couples relaxing on benches, as well as with China's newest beneficiaries of economic growth: dogs. Poodles, huskies, Labradors run off leash, tails wagging and tongues flailing, as their owners share health and grooming tips. Despite Shenzhen's tiny apartments, most of the dogs at the square are large breeds. Shunliu demonstrates his fetch ability in Shenzhen, China. "People with a high income tend to have poodles and bichons," said Dr. Chen Yan, a government veterinarian in Shenzhen. "Ordinary people tend to have Papillons, Pomeranians or mixed breeds. "People who keep dogs to show off have expensive breeds like Tibetan mastiffs which cost at least 50,000 yuan (about $7,800). Quality people who really love dogs don't care about the breed." How dogs are viewed is undergoing a major shift in China, and nowhere are the conflicting attitudes more evident than in Shenzhen, a city in a part of the country where dog meat is commonly eaten. Except for the occasional mutt, King Glory Plaza is a purebred showcase, as dogs have become a status symbol for many residents with newfound disposable income. Pang Yan said that all dogs in her hometown in rural Sichuan province were working farm dogs. After coming to Shenzhen to find work, she purchased Shunliu, a wide-eyed, obedient golden retriever who sleeps in her bed with her. "I understand dogs better than I used to," she says. "I understand that dogs need company from friends and their owners. They also need their owner's love, care and respect." This new coddling of dogs as pets does not mean the old custom of eating dog meat has disappeared. Type the Chinese character for dog, gou, into an iPhone, and predictive text will offer you meat, rou, as a logical follow-up character. Restaurants specializing in dog cuisine -- which advertise the health and tradition of the canine meat -- line bustling Shenzhen night markets. In a market near Dongmen, a Mecca for discount and wholesale shoppers, a customer asking for dog meat is told to go upstairs. On the second floor, there are basins of live crocodiles, hanging lamb and pig carcasses, but on that particular day no dog meat was available. "Come back tomorrow," says a little girl shelling clams. 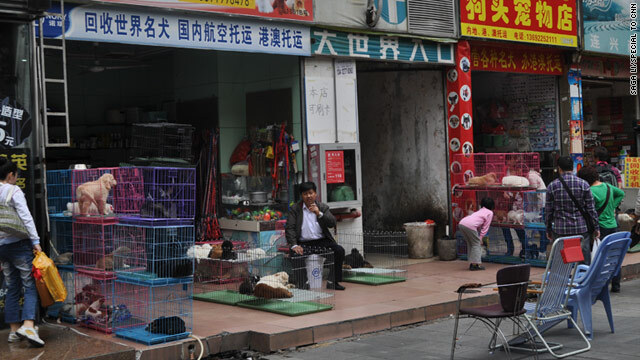 One man who sells in-demand breeds at a pet store in Dongmen says his career of selling dogs hasn't changed his outlook on eating dog meat. "How is it any different from eating any other animal?" he says. "It's just the same as beef." But some dog owners recoil at the thought. "I have eaten dog meat, once when I was young," says Pang, the owner of golden retriever Shunliu. 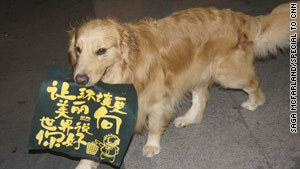 "But now I could never eat dog meat. When others eat dog meat I also tell them they shouldn't. When you really understand dogs you could never eat their meat. You could never be so cruel to your most loyal friend." There are more than 120,000 dogs kept as pets in Shenzhen -- where about 75% of its 9 million residents are migrant workers from other parts of China -- and the number is growing dramatically, according to Chen. "There are so many migrants in Shenzhen and they keep dogs to avoid feeling lonely," Chen said. "More people love dogs now and more people have the economic ability to take care of dogs." As more Chinese embrace dog ownership, some cities are trying to curb the trend. China Daily, a state-owned English-language newspaper, reported earlier this year that Jinan, the capital of Shandong province, passed a law requiring residents to obtain permission from their neighbors before their dog can be licensed. Shanghai enacted a one-dog policy starting in May, mimicking similar laws in Chengdu, Guangzhou and Beijing. In Jiangmen, a city near Shenzhen in Guangdong province, the city banned dog ownership outright in late July but retracted the law by early August after a howl of protest from local pet owners, state media reported. "There are many laws, but putting them into action is a different story," said Chen when asked about regulating dog ownership in Shenzhen. The only restriction currently in place in Shenzhen, he said, is a ban on "vicious dogs." For now, the dogs in King Glory Plaza are tolerated by the general public. But one exasperated security guard at the square mutters after a failed attempt at keeping unleashed dogs off a plaza display: "Are the dogs the pets, or are the humans the pets?"